The iPhone comes with a set of Apple earbuds, complete with a combination button and microphone that lets you pick up and hang up the phone, pause iPod tracks, or even move to the next iPod track via a double-click. But what if you’d prefer to use your own favorite pair of headphones, rather than Apple’s? The answer is to buy an iPhone headphone adapter, offering an iPhone-compatible mini plug on one end and a button and microphone on the other end, along with a place to plug in whatever headphones (or speakers, or cassette adapters — basically anything with a mini plug) you might have, as well as a clip to attach it to some part of your clothing close enough to your mouth to pick up your end of the conversation. The best of the bunch was the Griffin SmartTalk, a real bargain at $20. The SmartTalk’s microphone/clicker module is excellent, a compact block with a small integrated clip. The module was the least obtrusive of the ones I tested, and its button was easy to double-click when I wanted to switch tracks. Its microphone also offered the best sound quality of any of the adapters we tested, providing clear sound with a minimum of noise. The SmartTalk’s cord is wrapped in nylon, which makes it feel a bit classier than the rubber coating on the other adapters. Second best was Shure’s Music Phone Adapter, which has an easy-to-use button and good sound quality, if slightly noisier than the Griffin SmartTalk. Unfortunately, the Shure adapter doesn’t have an integrated clip, going instead with a plastic clip that’s itself clipped onto its headphone cable. The result is that the adapter’s microphone/button module, while an attactive, tapered shape, tends to flop around. The Shure adapter’s mini plug felt more stable than any of the other adapters’ jacks, with a extended plug that turns at a 45-degree angle, helping to reinforce the adapter cable. However, if the plug was pointed in the wrong direction, its angle would catch on the edge of my pocket when I was putting my phone away, pulling the entire adapter out of the iPhone. While the Shure adapter is still quite good, its $50 price tag is also more than double that of the SmartTalk. 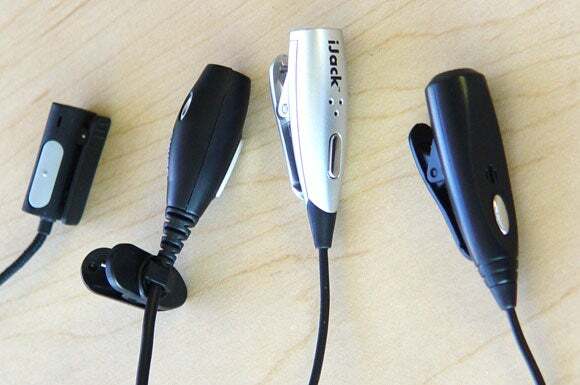 Boom Bags’ $20 iJack has a relatively small, tapered silver microphone/button module with an integrated clip. Its microphone was the loudest of those I tested, but its high gain comes at a price: it was also the noisiest microphone of the lot. The iJack’s button, however, feels cheap. While it was easy to click a single time, it was much more difficult to double-click. The result: I constantly found myself pausing my iTunes track when I wanted to move to the next one. Newer Technology’s $15 Mic Extender Cable for iPhone and FastMac’s $14 iPhone Adapter w/ Mic were the cheapest of the adapters I tried, and it showed. They appear to be identical to one another, both unattractive large black plastic microphone/button modules with integrated clips. Their buttons were just as difficult to double-click as the iJack, and neither’s microphone sound quality could match that of the Griffin or Shure adapters. iPhone adapters (left to right): Griffin SmartTalk, Shure MPA-3C, Boom Bags iJack, and the generic adapter sold as both the FastMac iPhone Adapter and the Newer Technology Mic Extender Cable. If you want to keep using your favorite headphones with your iPhone, an adapter is a great option. Though you’ll end up with a lot of extra headphone cable (unless you’re lucky enough to be using headphones from a manufacturer wise enough to offer short cables), you’ll end up sacrificing none of your audio quality, but you’ll gain the ability to control your iPhone and even have conversations without digging the iPhone out of your pocket. The best adapter I tested was the Griffin SmartTalk, which offers a nicely compact microphone/button module, good sound quality with little noise, and a good button. The Shure Music Phone adapter is comparable in quality, but it lacks an integrated clip and costs more than twice as much as the SmartTalk. The other adapters I tested will get the job done, but after all you’ve invested in your iPhone, you owe it to yourself to spend the extra five bucks or so for an adapter that’s noticeably better in quality. Lets you use any set of headphones with iPhone, by adding microphone and remote-control clicker.